in beautiful pictures and flowing poetry. A radically new, but ages old, perspective on the nature of material reality. Dr Grahame Blackwell presents, in two quite different styles, his findings from ten years of scientific investigation and careful mathematical analysis. "I very much enjoyed your book 'Tapestry of Light' ." "I just want to say a BIG, BIG thank you for your magnificent 'performance' last night! It was truly inspirational and a wonderful kick off to the whole evening. You are definitely a communicator!" "I thought your talk at the London College of Spirituality 2012 Forum was absolutely fantastic - interesting, funny, massively informative and you made some complex science very accessible. Your books have been on my to-buy list since then, how wonderful that they are now on their way. I really look forward to reading them." 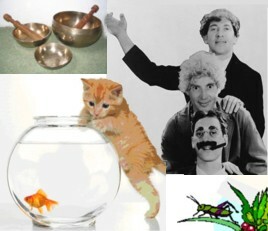 Here you'll find everything from the Marx Brothers to singing bowls, from grass-hoppers to goldfish - and much, much more - all in the name of science. gravity may be an electromagnetic effect - as proposed in Dr Blackwell's paper. a mutant gravity model called a vector-tensor theory, which they had found could mimic dark energy. Then came a sudden realisation. The new theory was supposed to be describing a strange version of gravity, but its equations bore an uncanny resemblance to some of the mathematics underlying another force. "They looked like electromagnetism," says Beltrán, now based at the University of Geneva in Switzerland. "We started to think there could be a connection." as being generated by "electromagnetic potential". irrespective of any material obstacles"
of matter itself to give characteristic effects of gravitation as extensively documented." - clearly identifying gravitation as an effect generated by electromagnetic potential. of light years, it might turn from an attractive to a repulsive force." 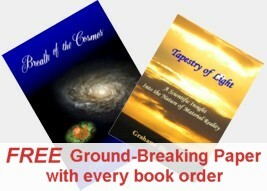 Dr Blackwell's paper describes gravity as a mix of attractive and repulsive forces. See introductory notes on Dr Blackwell's paper here. Members [register FREE above] - see a full non-technical overview free here.